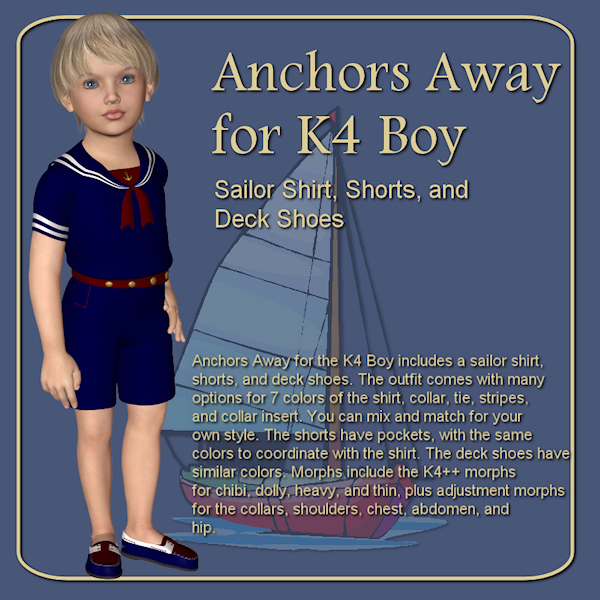 Anchors Away for the K4 Boy includes a sailor shirt, shorts, and deck shoes. The outfit comes with many options for 7 colors or the shirt, collar, tie, stripes, and collar insert. You can mix and match for your own style. The shorts have pockets and have the same colors to coordinate with the shirt. The deck shoes have similar colors. Morphs include the K4++ morphs for chibi, dolly, heavy, realistic, and thin, plus adjustment morphs for the collars, shoulders, chest, abdomen, and hip.